Son of John and Martha Gill, of 28, Cuerdale St., Burnley; husband of Mary Jane Gill, of 3, Unwin St., Burnley. News that he has been missing since an action on Jan. 10th, has been received at the home of Pte. Frank Gill (8601), at 28, Cuerdale-street. Pte. Gill was in the 5th Loyal North Lancs., but was formerly in the Territorials. Pte. 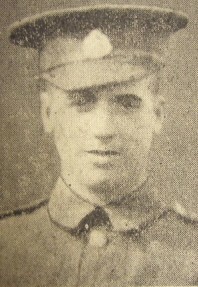 Frank Gill, of 28, Cuerdale-st, Harle Syke, who has been missing since Jan. 12th 1916, is now officially presumed dead. He was in the Loyal North Lancashire Regt. (No.8601) and was 28 years of age. He leaves a widow and one child, a boy. Pte. Gill was a time-expired man, having previously served for seven years. He went out with the Territorials to Egypt in the early days of the war. From there he was invalided home, after having passed through hospital, suffering from malaria fever. Afterwards he was transferred to the L.N. Lancs. His parents reside at 28, Cuerdale-st., and they have been officially informed that he is presumed dead. He had been missing since Jan. 12th, 1916, on which date (from letters received from comrades and from his officer) they gather that he was one who volunteered in the carrying out of a bombing raid in the Ypres district, and did not return. Pte. Gill was formerly employed at Messrs. Mason, West and Bather's Mill. He was connected with St. James's Church, Burnley, being a playing member of the football team. He has one brother serving in the Army, who arrived home on Wednesday, suffering from the effects of having been gassed.